One year on from the dramatic victory clinched by the all-new R8 LMS on its race debut at the Nurburgring 24 Hours, Audi is paying homage to the GT3 car that can lay claim to no less than 323 overall wins with a special edition of the all-new, road-going R8. 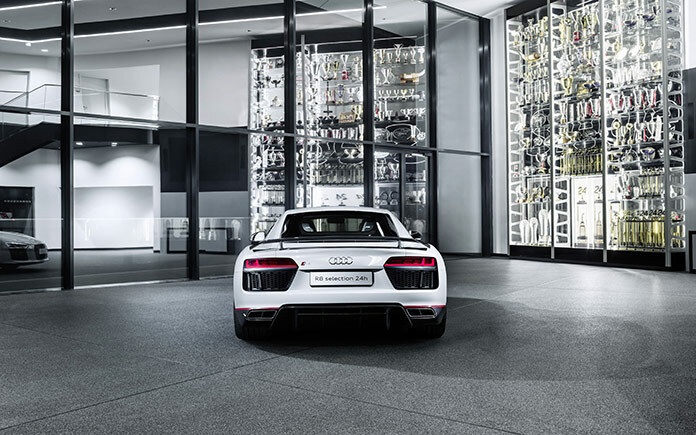 A total of 24 exclusive R8 V10 plus ‘selection 24h’ models will be built for the world market, combining competition-inspired styling enhancements with an exceptional specification that includes Audi magnetic ride adaptive damping, a sport exhaust for further amplification of the R8’s much-loved ten-cylinder soundtrack, and laser lighting. The Audi R8 V10 plus selection 24h is immediately distinguishable as a special edition by way of its tricolour exterior, which closely resembles its GT3 LMS counterpart. 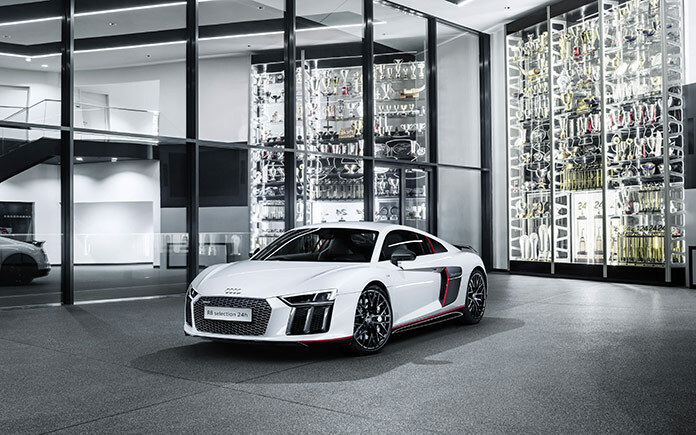 The multi-material Audi Space Frame body with its predominantly aluminium content and carbon fibre elements is finished in Suzuka grey, while Mythos black detailing with eye-catching Misano red accents draws inspiration from the classic Audi racing livery. 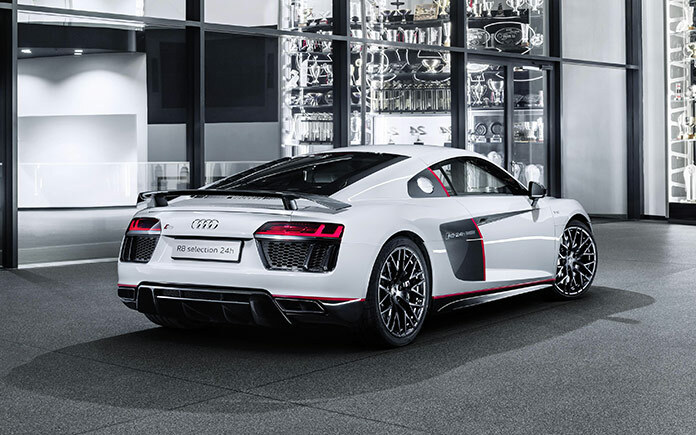 The front spoiler, exterior mirror housings, engine compartment cover, rear wing and diffuser are made from gloss-finish carbon fibre, as are the sideblades which feature a unique ‘R8 24h’ logo in a matt finish. The tailpipes of the standard sport exhaust system feature black trims and the 20-inch forged aluminium wheels in 10-spoke Y design are painted gloss anthracite black. Inside the cockpit, which employs a driver-focused monoposto arc to mirror the feel of a racing car, the limited-edition supercar offers full-leather upholstery and trim in rotor grey, with an Alcantara headlining. Based on the Audi R8 V10 plus, the selection 24h shares its 610PS output and intoxicating performance potential, dispensing with 62 mph in a mere 3.2 seconds before rapidly advancing toward a top speed of 205mph. A newly developed quattro drive distributes its power fully variably between both sets of wheels. The dry weight of the Audi R8 Coupé V10 plus is 1,454 kilograms; its body built using the multimaterial construction principle weighs a mere 200 kilograms. The combination of aluminium and carbon fibre-reinforced polymers (CFRP) in the Audi Space Frame opens up entirely new dimensions with regard to weight, rigidity and crash behaviour. Last year, the new generation of the Audi R8 LMS made a dream debut and won its first 24-hour race on the Nürburgring at the very first attempt.